All you need to know about Match-on-Card – New website! Match-on-Card makes a smart card truly personal; it is the concept of storing and matching fingerprints on a smart card. It’s a technology on the rise with millions of users worldwide. Now, all you need to know about Match-on-Card is available at www.matchoncard.com. 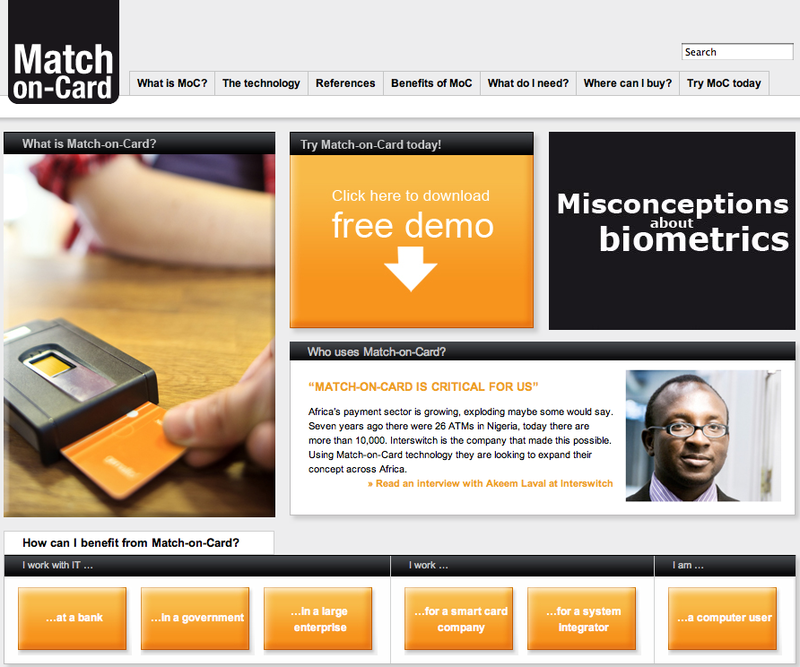 At http://www.matchoncard.com you can try Match-on-Card, find whitepapers, read about relevant standards, learn how you or your organization can benefit from the technology and read case studies. The aim is to present a comprehensive picture and offer reliable information about Match-on-Card technology. Match-on-Card technology with fingerprint recognition is used in many types of applications globally. It is applied on national ID cards, employee IDs, health cards and voting cards, among others. People can use it to log on to computers, make financial transactions, pay taxes and use government e-services. Find inspiration for many more application areas at http://www.matchoncard.com. Recent feasibility studies and various standardization initiatives surrounding the technology is a confirmation that there is a lot more to come for Match-on-Card. But all of this can also be confusing for those seeking information about Match-on-Card. There is simply a need for comprehensive information for buyers, end-users and companies involved in Match-on-Card projects, or for those who are just curious about Match-on-Card. That’s why the market-leader within the Match-on-Card industry, Precise Biometrics, now launches http://www.matchoncard.com. Visit http://www.matchoncard.com to learn more about the versatile Match-on-Card technology and find out how you can benefit from it.